For Legally Blonde fans all over the world – this is the ultimate moment. Meeting Reese Witherspoon and handing over the dissertation you spent long nights pouring every part of your being into. Reporter Lucy Ford’s university essay focussed on the 2001 film and its role in creating strong female characters. She says the dissertation was “basically a 15,000 word love letter” to Legally Blonde. Ford, who is an entertainment reporter for Bauer Media, was interviewing Witherspoon, Oprah Winfrey and Mindy Kaling for the release of A Wrinkle in Time – Disney’s latest offering, which premiered in London on Tuesday evening. The 26-year-old started off the interview by declaring herself a massive fan of all three women, but confiding that she had actually spent many hours studying Witherspoon – watching Legally Blonde in the region of 800 times. Witherspoon’s face shows a mixture of genuine shock and delight when she is handed the pink-ribbon bound dissertation. “Really? !… That’s so sweet,” gasped Witherspoon in disbelief, as she shuffles forward eagerly on her seat to receive the document. “Thank you – that really touches my heart,” gushed the star. Ford says that before handing over her dissertation, “I was nervous. Like REALLY nervous. The entertainment reporter says she readied herself for a lukewarm – or even disappointing – reaction and had set her expectations pretty low. But far from it, the three women appear delighted, with Witherspoon even asking one very important question at the end of the interview. “Is it scented?” the star asks – referring to her Legally Blonde character’s trait of perfuming her work before submission – and creasing up when Ford replies in the affirmative. Legally Blonde is the story of Elle Woods, a glamorous blonde with a penchant for bubblegum pink and manicures. The film follows her as she is accepted to Harvard Law – chihuahua and all – and struggles to fit in because of the way she looks. The story sees her battle against the preconceptions others have about her, to graduate top of her class, overturn a miscarriage of justice along the way AND get the guy – all while remaining true to her bubbly, pink personality. 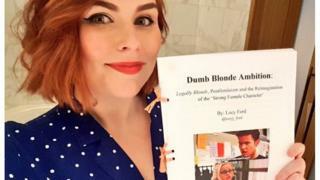 Ford, while in the third year of her University of Leeds’ cultural studies degree, says she struggled to find anything she wanted to write her dissertation on. She says she was watching Legally Blonde the day of her submission deadline and decided the film would be the topic she picked. “The dissertation analyses the portrayal of strong women on screen and how they had frequently been limited,” Ford explains. “It’s about how strong or clever women were often portrayed as masculine – but how Elle Woods dispels those ideas. Ford says since her Reese Witherspoon moment, people on Twitter have sent her the front covers of their dissertations on popular culture and have even asked for a link to her essay. “People have sent me their subjects including Disney princesses and the Spice Girls, which sound really interesting and I’d love to read,” she says. 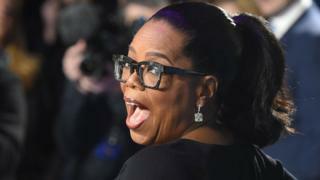 Ford says, after the camera had stopped rolling, Witherspoon was flicking through her dissertation and pointed out to Oprah “Oh you’re in it too!”.